Mack the Bullmatian at 8 months old—"His mother was a full-blooded Dalmatian and his father was a full-blooded English Bulldog, which makes him a 50 / 50 F1 (first generation) Bullmatian hybrid. I think he is incredibly unique! He has a wonderful temperament too!" The Bullmatian is not a purebred dog. 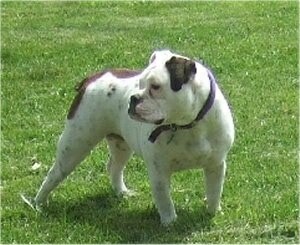 It is a cross between the Bulldog and the Dalmatian. The best way to determine the temperament of a mixed breed is to look up all breeds in the cross and know you can get any combination of any of the characteristics found in any of the breeds in the hybrid. Not all of these designer hybrid dogs being bred are 50% purebred to 50% purebred. It is very common for breeders to breed multi-generation crosses. 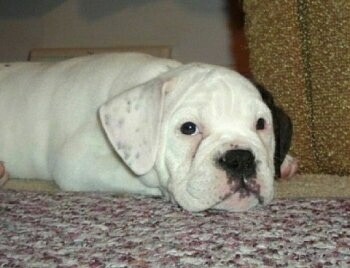 "This is Duke the Bullmatian puppy at 3 months old. 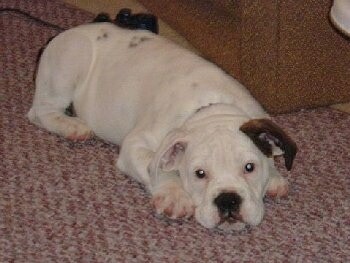 His mom is a Dalmatian and his dad is an English Bulldog. Duke is very smart, has endless energy and is very curious of the world and everything in it! He loves to run in sprinklers and play with his squeaky toys. A cute trait he got from his dad (English Bulldog) is that he snores, which we think is adorable, and makes grunty sounds—which we think adds a lot to his personality! He is truly one of a kind and we are very proud to have him." 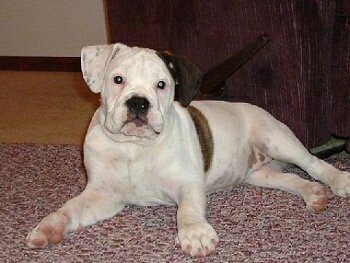 Aspen the full-grown Bullmatian—Aspen's mom was a ¾ English Bulldog and ¼ Dalmatian F1B hybrid (first generation crossback) and her dad was purebred English Bulldog.